Okay, so I may be the only grown woman who STILL has a thing for Scooby Doo. But- I do love a good mystery! 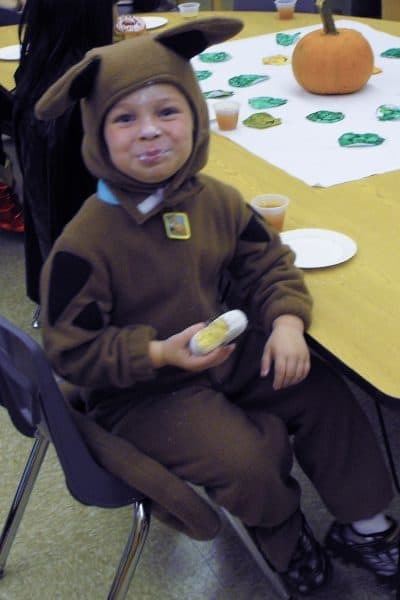 I was lucky enough that Connor’s first cartoon love was also Scooby Doo, and he wanted a Scooby Doo Costume. Now, I know you hate the idea of sewing. 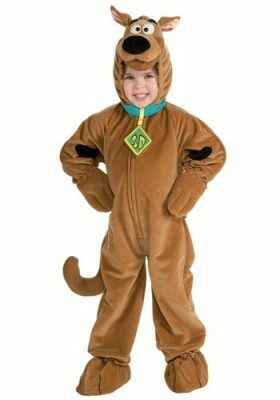 So, I will tell you that you can still find a great Scooby Doo costume online, but you may not find it readily available at your local superstore. Right-seasonal items. I chose to make my son’s costume from scratch. I started with a pattern from Simplicity. Patterns will give you the approximate fabric requirements on the back of the envelope. For Scooby Doo, you will want to go with a brown low-pile fleece. Remember, if you are going to be layering, make the next largest size. If you are altering the pattern, you may also want to buy extra fabric. Now I followed the basic pattern design you see here for Item C, the Monkey. However, I knew my chest piece would be different since it was going on the back of the costume, and I knew that my child would not be comfortable with the tail permanently attached. Of course, the monkey ears also didn’t really work for a dog! You may choose to make the body as is. However, I made the tail as a separate piece. No need to alter the basic tail pattern itself. Simply ignore the instruction to insert into the seam when you get to that part. Completing the body of the costume is the first step. Tip: If your child is walking, I recommend not sewing the bottom of the feet on. This will enable your youngster to wear his own shoes and be more comfortable in the long run. Once you have the brown jumpsuit sewn together, I would suggest having your child try it on for any issues with sizing. You will also notice any poorly sewn seams or stitches easier this way. 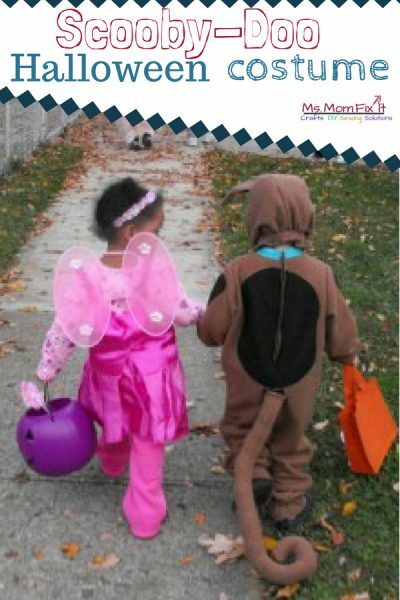 While your child has the costume on, mark the back of the outfit by placing a pin at the top and bottom. You are marking the area where Scooby’s spot will be. For the back of the costume, you will cut one large oval for the spot on Scooby’s back. If you pay close attention to the character, you will also notice that Scooby Doo has 2 more triangular spots on his front legs towards the front. So I cut 2 rounded triangles from the black felt and then made 2 slightly smaller than the first step. 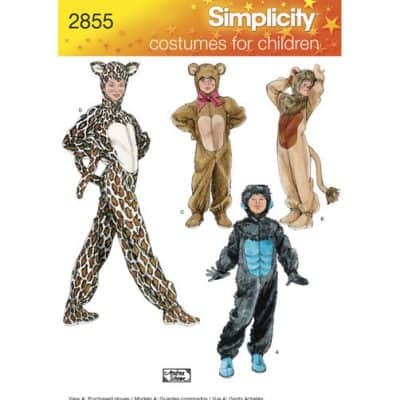 You will sew on 1 of each size to the top of the child’s arms. This may seem like a lot a work, but it is so worth the reward watching your little one smile! Next, you want to use your teal ribbon to cover the neckline of the costume. Before you sew it into place, make sure you have placed your dog tag in the desired location. The current children’s pattern has the zipper in the front meaning you can either sew the dog tag to the fabric above the zipper on one side or possible just attach the dog tag to the zipper itself. Secure the ribbon from edge to edge on the collar and sew flat. The next step is the hood. As mentioned earlier, the rounded ears don’t work well for Scooby Doo. I simply used the base of the ear (that attaches to the hood) and made triangular shapes for the new ears. Scooby’s ears have a black triangle on the front that you will want to sew on prior to sewing the front and back of the ear together. Once your ears are completed and attached to the hood, you will put a Velcro strip on each side to keep the hood in place on your special night. Finally, let’s talk again about that tail. So, your tail should already be cut from the brown fabric. Sew the outside together leaving just the bottom open. Stuff your tail with Polyfil but make sure not to over-stuff it as you will need to sew the bottom closed. Attach Velcro to the tail and then place the opposite Velcro strip on the suit where you wish the tail to hang from. Be aware that this will take more than one Velcro strip as the tail will be quite heavy once filled.